They're big. Really big. The smallest run in the range of ten times the mass of our sun, while the biggest break the scales at potentially over a hundred times the mass of the sun. But even the small ones start out much, much bigger, and have only shrunk to that size now due to extreme outbursts that ejected their own atmospheres into space. They're bright, with luminosities starting at 250,000 times that of the sun, and going up to three million times that of the sun. That puts their surface temperature in the 10,000 – 25,000K range; several times hotter than our own star. Their rarity is probably due to their short lifetimes. Many of the most massive stars – and maybe all of the big ones – go through this phase. But it's towards the tail end of their lives, right before they start riding the supernova train, and will go through this LBV stage in less than a hundred thousand years. That's short enough that in a typical galaxy we only expect to see a total of a few hundred at any one time. They're impulsive, turbulent, and unstable. 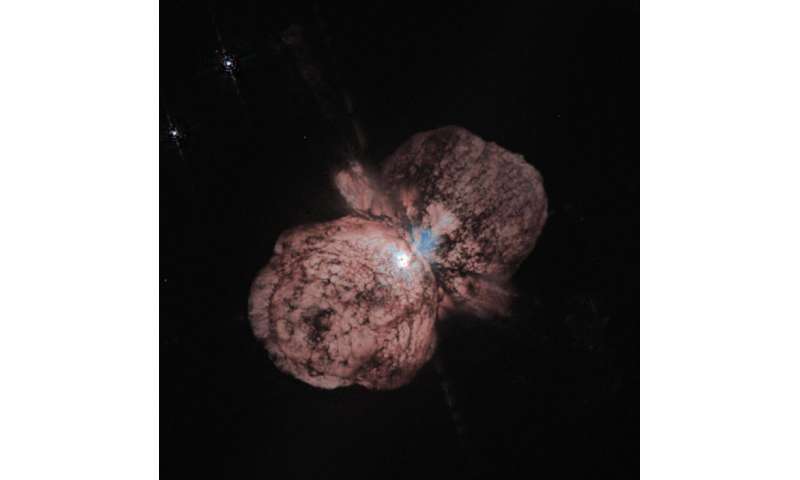 One of the first LBV stars discovered, Eta Carinae, was the second-brightest star in the sky…for three days in March of 1843. It is no longer visible to the naked eye. Perhaps the biggest mystery to LBV stars is what makes them so dang variable. What drives their infrequent but fantastic outbursts? While it's hard to tell (obviously, because as you might imagine these stars are incredibly complicated physical systems), researchers suspect it involves an intricate dance between the inner and outer layers of the stars. LBV stars experience some of the worst IBS you could possibly imagine. Their guts are constantly rolling up and down, with massive convective currents ferrying hot material from the core and cool material from the surface. This is pretty standard as far as normal stars go, but in LBV stars this process goes nuts, with the convection actively pushing chunks of the outermost stellar layers well beyond their normal confines. Slightly detached from the star due to the convection, the outer layers finally catch a break from the intensity and start to cool off. This increases their density, blocking the starlight beneath them. The radiation then pushes – just like a lightsail but way more seriously – that chunk of star stuff, completely ejecting it from the star altogether in a massive burst of light and matter. There are a lot more details that need to be worked out in that story, and an important question lingers: Is the LBV stage of a massive star, with all its ill-tempered fits, the precursor to an even crazier epoch of stellar evolution known as the Wolf-Rayet phase, or does it lead directly to the final supernova show? If we had a few hundred thousand years to just watch these stars live and die, this question would be easy to answer. But we don't, so it's hard. One clue comes from their relationships to their stellar kin. If the life story of the most massive stars in our universe is "giant star ? luminous blue variable ? Wolf-Rayet ? kaboom," and each stage is relatively short, then we ought to see these stages all mixed together in the same general vicinity. A bunch of big stars would be born together, grow old together, and die together. But if LBV stars are their own, independent road to boom-town, then there shouldn't be any general relationship to their Wolf-Rayet cousins. They'll be in their own retirement communities on the opposite side of the city, so to speak. The best place to go hunting for these potential connections is the Large Magellanic Cloud, since it's a pretty isolated clump in a single patch of the sky. The research has gone back and forth over the past few years over the question of the clumpiness of LBV stars, as astronomers tweak and twist the definitions of "clumpiness" and "LBV." The latest iteration, thanks to a paper recently accepted for publication in the Astrophysical Journal, strengthens the "standard" (as standard as it gets in these kinds of cases) picture of LBVs: they are just one of the many vicious stages towards the end of a massive star's life. Which means that by understanding how LBVs work, we can learn how giant stars eventually die. Perhaps the biggest mystery to LBV stars is what makes them so dang variable. What drives their infrequent but fantastic outbursts? Genic energy born deep in the core from photon blue shifting. This explanation from SubQuantum Mechanics is also why Pluto and our gas giants are too warm. Blue shifting increases in the presence of matter, explaining the Pioneer anomaly, and extra-galactic red shifting explaining the seemingly always too distant quasars. This increases their density, blocking the starlight beneath them. The radiation then pushes – just like a lightsail but way more seriously – that chunk of star stuff, completely ejecting it from the star altogether in a massive burst of light and matter. Likely one mechanism whereby a sibling star or planet is born. After all, binaries are bountiful.